Weeknights can be a difficult time to stick to your post weight loss surgery diet. After a full day’s work and everything else you have to do (pick up the clothes from the dry cleaners, help the kids with homework, take the dog for a work, etc), many people find it difficult to cook a nutritious, healthy meal. This easy weeknight dinner recipe can be altered based on what ingredients you have on hand so you don’t have to include a trip to the grocery store, too. Use spinach if you don’t have kale. If you don’t have fresh scallions, substitute onion or diced scallion, even roasted red peppers would work. Frittatas cook up quickly, and don’t even have to look pretty to be delicious. The eggs and ham provide the high quality protein that turn this dish into a dinner. In addition to protein, the eggs are a good source of vitamin A, B12, folate, selenium, riboflavin, choline, lutein, zeaxanthin, and omega 3 fatty acids. Although eggs are high in cholesterol, evidence suggests that eggs don’t adversely affect cholesterol levels in the majority of people. As always following your lap band surgery, chew your food well. Move oven rack close to broiler, about 6 inches away. Preheat broiler to high. In a large ovenproof skillet, warm oil over medium high heat. Add kale, stirring about 3 minutes until wilted. Add scallions and cubed ham, cook 1-2 minutes. Whisk parmesan cheese into your beaten eggs. Season with onion powder, salt, and pepper. Pour egg mixture over your neatly arranged kale in the skillet. Reduce heat to medium-low. Cook mixture without stirring until frittata is almost set, about 10-12 minutes. Transfer ovenproof skillet to the broiler, watching carefully until top is set, about 1-2 minutes. 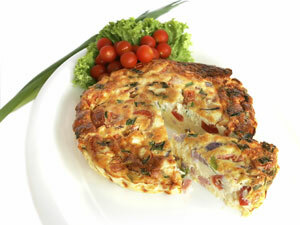 Once it’s cooked, use a spatula to unstick the edges and allow the frittata to easily slide onto a plate to cool. Cut into pieces and serve. The leftovers can make a great lunch or dinner for the next day. The above recipe is provided by Dr. Shillingford, a board certified general surgeon specializing in advanced laparoscopic surgery. His Boca Raton office serves patients from all over the state of Florida, from Miami to to Tampa to Jacksonville, seeking weight loss solutions including adjustable lap band, gastric bypass, and sleeve gastrectomy surgeries. Call Dr. Shillingford’s office at (561) 483-8840 for a free weight loss consultation if you are considering lap band, gastric sleeve, or gastric bypass surgery.